For courses in English Composition. This version of The Longman Reader has been updated the reflect the 8th edition of the MLA Handbook (April 2016)* The acclaimed rhetorical modes reader, with remarkably detailed writing guidance Best-seller The Longman Reader includes its abundant and highly praised pedagogy plus a wealth of readings organized by patterns of development (an alternative table of contents organizes them thematically). The opening chapters focus on reading critically and the writing process. The subsequent chapters begin with detailed writing instruction, including an annotated student paper, and end with professional essays. These new and beloved professional essays range widely in subject matter and approach from the humorous to the informative, from personal meditation to argument and capture students' interest while demonstrating specific patterns of development. 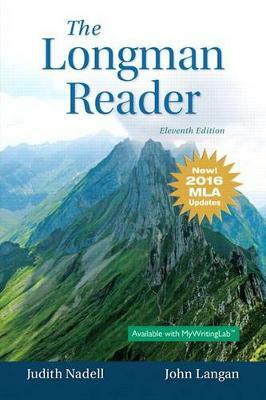 The Longman Reader shares many of the same readings and other core material with The Longman Writer. * The 8th Edition introduces sweeping changes to the philosophy and details of MLA works cited entries. Responding to the increasing mobility of texts, MLA now encourages writers to focus on the process of crafting the citation, beginning with the same questions for any source. These changes, then, align with current best practices in the teaching of writing which privilege inquiry and critical thinking over rote recall and rule-following. "